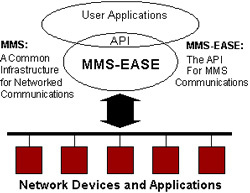 MMS-EASE is a C language Application Program Interface (API) for the Manufacturing Message Specification (MMS) protocols as specified by MAP V3.0 for communications between programmable devices on the factory floor. Easy-to-use C language API simplifies user application programming for both Client and Server applications. Supports Ethernet (802.3) networks in a variety of popular computing environments. Implements all MMS core services for ISO 9506 and DIS 9506 per N.I.S.T. agreements. Includes high-level "virtual machine" functions for processing MMS objects automatically without complex programming. SISCO, Inc. (Systems Integration Specialists Company, Inc.), 6605 19½ Mile Road, Sterling Heights, MI 48314-1408. Tel: 810-254-0020; Fax: 810-254-0053.